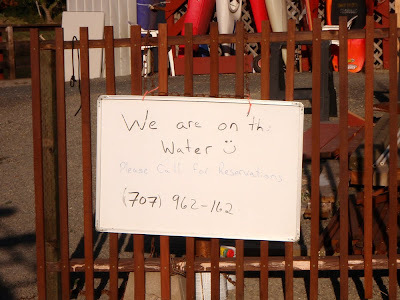 Liquid Fusion Kayaking: "We are out on the Water"
"We are out on the Water"
If you stopped by our Fort Bragg location at Dolphin Isle this week, you are likely to see "We are out on the Water" posted on our gate. WOW!!! We have been having the best stretch of weather and some of the nicest people to share it with . Sunshine, new birds, lots of active wildlife, glassy waters . 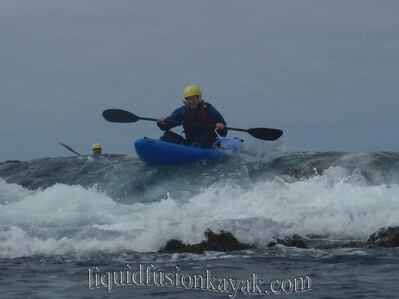 . . makes kayaking on the Mendocino Coast all the sweeter. Birds as usual are on my brain as I admire the gull chicks growing big on "First Rock" in Noyo Bay, the black turnstones on the shoreline, common loons swimming about with their heads tucked under the surface. The osprey have probably been a highlight for many of our guests. We watch and as they hover and then dive for a fish. After bringing it up, they shake their feathers out and circle before heading to their perch or nest. My highlight has been seeing oystercatcher chicks. These guys are so well camouflaged that we rarely see them. Can you see the chick in this photo? If so, sign in and leave us a comment. 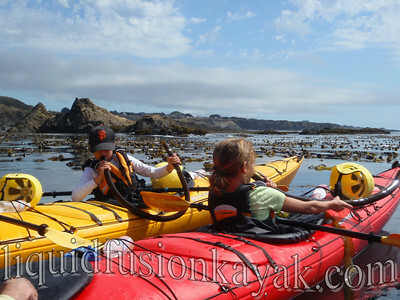 Kelp forests and kelp horns, jelly fish, sea urchins, sea stars, and sea caves have dazzled us all on our coastal paddles. Yes, we are back to our antics of making kelp horns. I share my french horn lessons from elementary school with the recipients of my kelp horns . . . make a tight embouchure to produce a clear sound. 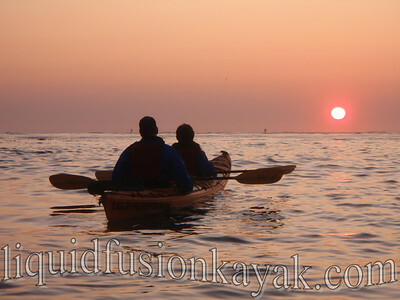 Jeff and I have enjoyed sharing kayak adventures with families and friends from near and far. Jeff enjoyed a super fun tour of Caspar Bay with Michael who lives in Caspar and wanted to kayak in Caspar Bay for his 65th Birthday. 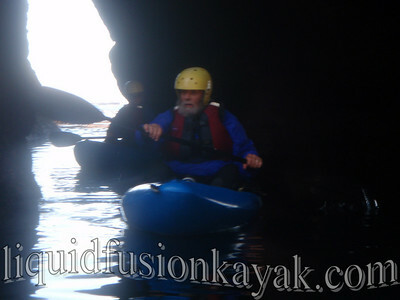 We have had numerous local friends kayaking with us as well as some passing through. Some whitewater paddling friends from San Diego joined us for a rock gardening session this week that was definitely on the WILD side. If you are perusing our blog, I hope that you are enjoying our posts and having as amazing a summer as we are. 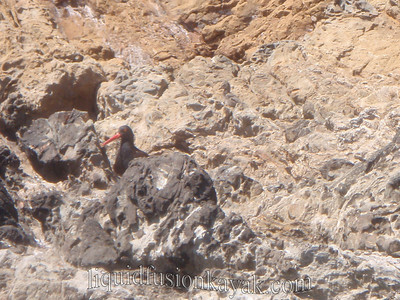 Leave us a comment if you can see the oystercatcher chick.